Let our Company Picnic entertainment make your event a blast! Want your employees to have fun and feel appreciated? Want them laughing and enjoying themselves at an event they’ll remember for the entire year? Let About Faces make that happen for you. Our Caricature artists and Face Painters and Balloon Artists will entertain everyone who watches, and also provide some of your guests with a souvenir to take home. Our Jugglers, Magicians, Stiltwalkers, and Clowns will perform for everyone or stroll throughout your event and entertain guests one on one. Our Henna Artists, Fortune Tellers and Airbrush Artists will leave your guests with a wonderful memory. 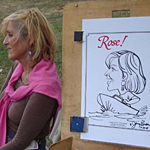 Captivating Caricature Artists – Great for Company Picnics! 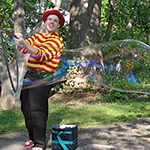 From caricature artists to balloon sculptors, fortune tellers to stilt walkers, and everything in between, our entertainers are sure to make any picnic or party a memorable one. "The [company picnic] event was great! Your services were outstanding! Everyone loved the caricature artists and the kids loved the balloonist. Thanks for everything! Hope to do the same next year!" 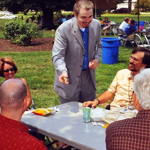 "We were very pleased with the [caricature] Artists we secured for our Employment Picnic. They were pleasant, and professional. In fact we had staff approach us later asking for the company information so they could contact you regarding arrangements for their own personal events. The staff that I had to work with through at the office to secure these artists were VERY nice and helpful. All in all a great experience." "We are always delighted with [Clown] BBow’s performance at our events, which is why we request him by name. 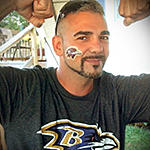 He was fantastic, entertaining, and his balloon art is by far the best of the best." "Our event went fabulous and many thanks to your caricature artist, Issac K... he was very professional, arrived on-time, and even stayed a little after to get in some late minute arrivals! His artistry was raved upon by our employees! Please express our many thanks and raves with him! We have nothing but good things to say and look forward to utilizing About Faces Entertainment again next year for our event, except next year we know to book Issac K a little longer! Very pleased and look forward to next year! Many thanks!"